A thinly cast bronze mirror of circular form, the reflecting surface of slightly convex shape. The concave back is decorated in low relief with a quatrefoil ornament arranged around a prominent central boss and containing eight characters in archaic script. The space between the four leaves of the central quatrefoil is filled with a pattern of stylised, coiled dragons. Around this central scene runs a band of fifty.one characters with bands of linked arcs and archaistic pattern around it. The mirror has a well-preserved surface that still retains its reflective quality despite having large areas of bright green encrustation. The eight–character auspicious inscription in the middle reads “[If you own this mirror] your posterity will have long life.” The inscription on the outer section reads “I made this mirror with three types of metal, …. On the reverse are four guardian animals to ward off ill fortune. [If you possess this mirror] you will have a harmonious marriage, and with its Daoist masters should have his life allotment extended. [You will have] longevity comparable to Dong Wangfu (King of the East), Xi Wangmu (Queen Mother of the West), and immortals such as Wang Qiao and Chi Sonzi….’. Mirrors occupy a very important place in Chinese culture. Not only were they used to reflect a person’s face, but they were also thought to reflect the heart and soul and used in religious rituals and in temples. 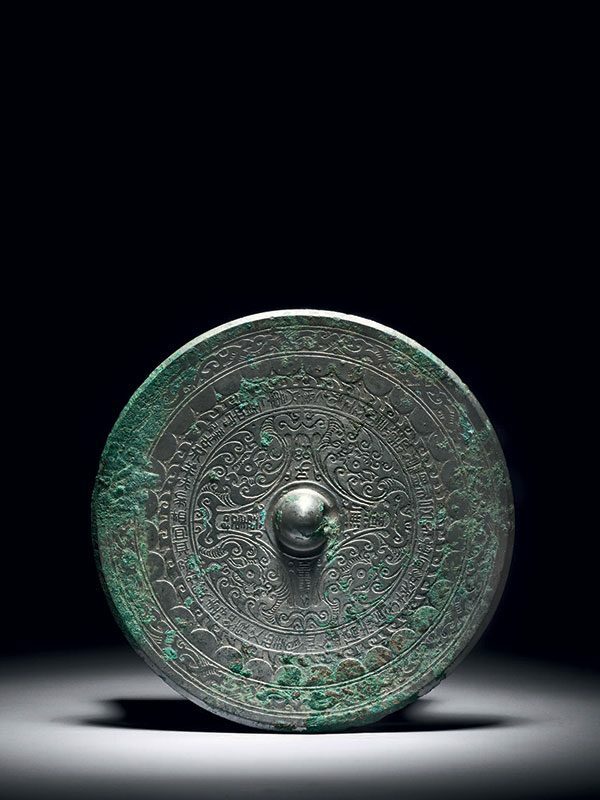 Chinese bronze mirrors are normally cast from an alloy of copper, tin and lead, which is the case in this mirror, according to the inscription. The four Daoist immortals mentioned in its inscription further suggest the protective function of Chinese mirrors in general. Relatively thin bronze mirrors with a distinctive central quatrefoil design, a long, continuous inscription and a band of linked arcs to the rim can be firmly dated to the Eastern Han dynasty. The closest comparable published example is a mirror now in the Chongqing Museum, which is dated in the inscription to the third year of the Xiping period in the Han dynasty (174 AD). Further comparable mirrors are in the Sumitomo collection, the Carter collection at the Cleveland Museum of Art , and in the Graham collection.